If you listen hard enough, you'll hear their whispered warnings... When she escaped Diablo Springs years ago, Gracie Beck swore she'd never return. But all that changes on the night of her grandmother's tragic death when Diablo Springs lures Gracie's teenage daughter to its treacherous border.... read more Fearing the threat of that haunted place and the danger it poses to her daughter, Gracie races to the rescue-only to find herself trapped in the turbulent current of a hundred year old curse and the menacing spirits that have terrorized the town's dusty streets for a century. Author Reilly Alexander has ghosts of his own in Diablo Springs-ghosts he needs to lay to rest before he can move on. Tempted by the promise of a bestselling story, he reluctantly returns to Diablo Springs only to find Gracie Beck waiting there. At first, Gracie wants nothing to do with the man who betrayed her years ago, but feelings she thought long gone spark to life when she sees Reilly again. She is drawn to his quiet strength and the burning desire he ignites within her. 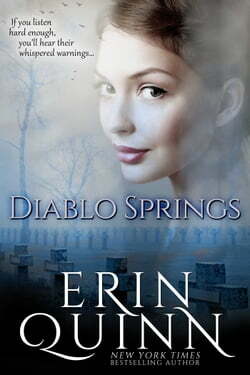 Reilly is determined to help save Gracie's daughter and prove his to love the woman he's never forgotten, but they've come to a dangerous place where even the dark waters are sinister and every lurking shadow should be feared.... Diablo Springs' history wants to be retold, but will the new ending destroy them all?